The state has made incremental economic advances in job growth as the recovery continues, using enhancements and advances to some of its established economic programs. The purpose of the act is to stimulate economic growth and neighborhood revitalization in economically depressed areas of the state. Businesses located or those that choose to locate in a designated enterprise zone can become eligible to obtain special state and local tax incentives, regulatory relief, and improved governmental services, which would provide an economic stimulus to an area that would otherwise be neglected. The new law extends the sunset of the program for 25 years and creates a process for existing communities with zones and new communities to apply for the designation. “We also got them to add some enterprise zones in the state,” Vaught says. The state’s Advantage Illinois program, using federal grants, has already funded 17 direct capital investments for ventures such as biotech companies. Vaught says that instead of working individual venture projects, the state partners with the existing venture capital industry in Illinois similar to a loan participation arrangement. “For example, if we can find a good investment with them and they put in $800,000, we put in $200,000, we think that encourages that venture industry to put some more capital into those early stage startups,” Vaught says. The state is looking for more foreign investment to increase exports while creating more jobs, especially in manufacturing. Mitsubishi has invested $45 million to retool the facility to begin production of the new vehicle, which was previously produced in Japan. Since January 2010, Illinois has added 136,000 private sector jobs and 40,700 manufacturing jobs. “So that renaissance of manufacturing related to the international economy is a key part of our strategy,” Vaught says. In the state’s second largest city just 42 miles west of Chicago, Sherman Jenkins, executive director of the Aurora Economic Development Commission, says the region is continuing to attract headquarters operations for manufacturers, in addition to high-tech companies and data centers. Part of the city’s attraction for those businesses is the 43 miles of fiber-optic network that runs throughout the city. “What has really helped us is our reputation for getting projects approved on time,” Jenkins says. He points to the city’s online permit review process that enables businesses to see the progress as one reason businesses like working with the development services team in the city. Illinois is home to many federal research labs, such as the Argonne National Laboratory focusing on advanced materials, chemicals and energy technologies, as well as transportation technology and biotechnology. Biotech and pharmaceutical giants have a strong presence, including Abbott Laboratories, Baxter Healthcare. The biotech cluster includes nearly 2,000 establishments and 62,600 employees. Illinois is the fifth-largest exporting state in the nation. Seventy-five nations maintain consulates in the state and more than 30 international banks have established branches or representative offices in Chicago. 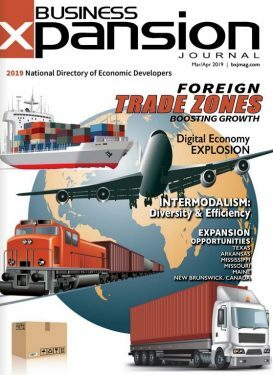 More than 150 export managing/trading companies and more than 100 international freight forwarders and customs house brokers have offices in Illinois. Vaught says that 43 percent of the entire state population has a college degree, a community college associates degree, or a union or other trade certificate. “And that number is growing,” he says. There are nine public colleges and universities in the state — including the Southern Illinois University system with campuses in Carbondale and Edwardsville; and the University of Illinois system, with campuses in Chicago, Springfield and Champaign-Urbana. The state also has 66 private colleges and universities, including standouts such as the University of Chicago, Loyola University and Northwestern University, all in Chicago. With the northern part of the state dominated by Chicago’s sprawling developments, the state’s smaller cities are looking to take advantage of their land offerings to keep business growing. One of those cities is Montgomery, a growing city of approximately 20,000 people just west of the greater Chicago area. Charlene Coulombe-Fiore, executive director of the Montgomery Economic Development Corp., says that Montgomery has a parcel of land near the city that is on the verge of being sold to investors who might start looking at developing a park. “That is exciting because it’s something that not many communities in this area have,” she says. Vandalia, in south central Illinois with a population of approximately 7,000, is opening bids on two parcels of property on the west interchange area of the city, says Mayor Rick Gottman. The biggest employer in the area is the 1,520-acre Vandalia Correctional Center, a minimum security prison for men. Renowned throughout the Midwest, Carlyle Lake is the largest manmade lake in Clinton County 50 miles east of St. Louis, covering 26,000 acres. It offers great beaches, 15 public boat ramps and three marinas with more than 30 species of fish for anglers to go after. Illinois is an interesting mix of big city fun and small town relaxation. Aurora is just finishing up on a major entertainment complex downtown set to open next year called River Edge Park. The downtown area already has the 53,000-square-foot Hollywood Casino Aurora and the 70,000-square-foot America’s Historic Roundhouse restaurant and brewery. Moody says that Tuscola has a strong retail base with the redevelopment of the 47-store Tanger Outlet-Tuscola. They are now hitting an all-time high in sales tax revenue. “Outlets have turned a little better nationally than other retail,” Moody says. “So this has been just kind of a bright spot for us.” The increased sales revenue has allowed them to spend $2-$3 million in the past year on public infrastructure. “We have been really fortunate in a bad economy to be able to make these investments and still be able to be attractive,” Moody says.